I'm such a sucker for these old worlds-in-collision shots from the Paramount backlot. Here, we have Robin (Burt Ward) from the classic "Batman" television series with Billy Mumy and Angela Cartwright from "Lost in Space." What I like about these shots - probably taken at lunchtime when everyone was hurrying off for a sandwich or pizza - is that everyone is in costume, immaculate, and appear just like they would on-screen. The appear to be standing in front of a "boulder" from "Lost in Space." A little digging shows this picture was taken in 1966. Here's another one from the same meeting. 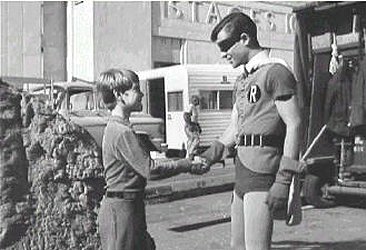 Bill Mumy and Burt Ward on the set of "Batman." I don't know whose trailer that is in the background. 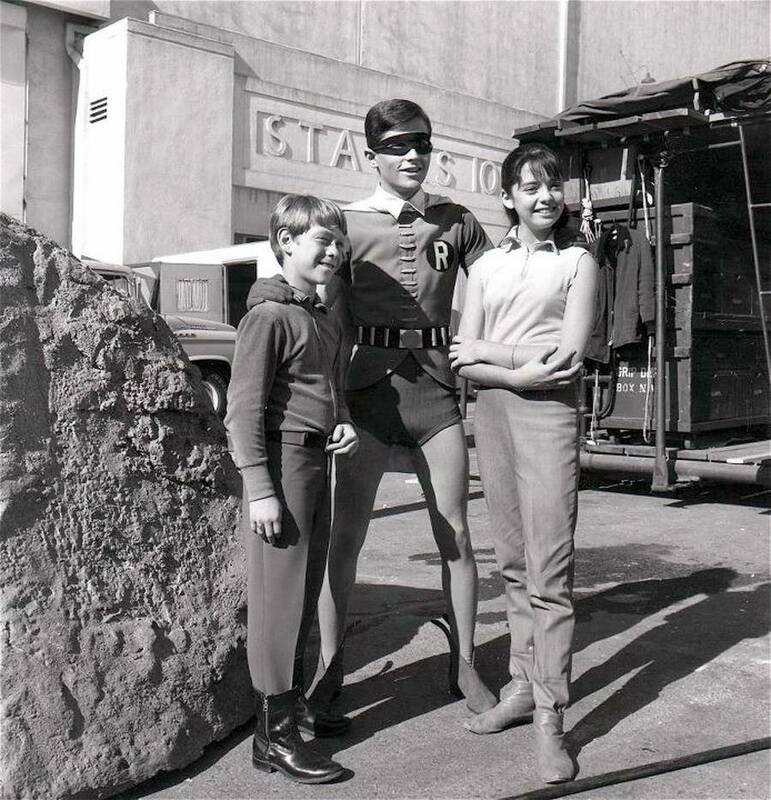 This apparently was on the "Batman" set at 20th Century Fox Studios. Everyone always seems to have had a great time on the old sets, it doesn't look faked or show people gritting their teeth. Let's not leave Adam West out of the picture! 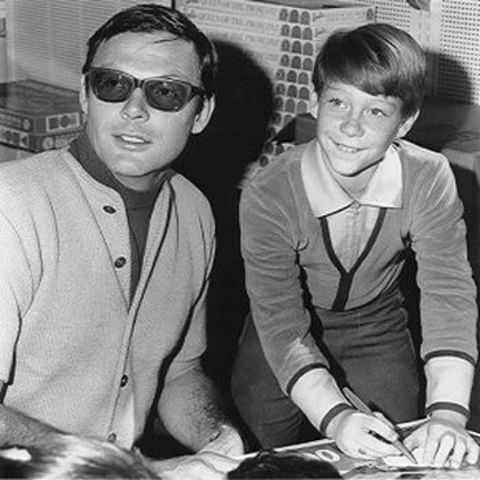 Bill Mumy and Adam West. Below is Adam West with another familiar face, the Green Hornet (Van Williams) relaxing with the Black Beauty. Everyone had fancy rides in the '60! 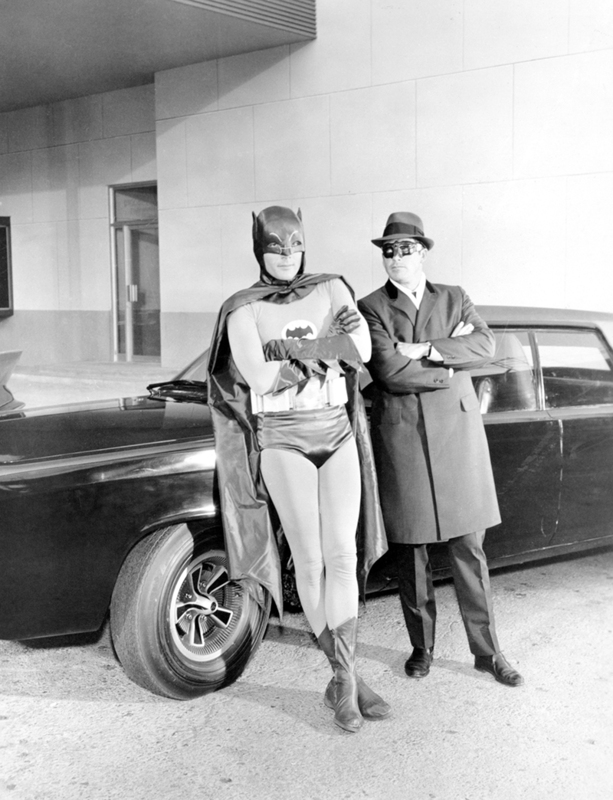 Adam West and Van Williams with the Black Beauty car (The Everett Collection). I'll continue to post these old "worlds in collision" shots from time to time, they're a great halfway point between fantasy and reality.